You may have noticed that UCL Museum’s current theme is ‘migration’, a topic that hits the headlines daily. Unstable climates and widespread political and socioeconomic unrest are forcing people to move, seeking safety and security. Migration is not a new concept in our human story, Homo sapiens initially evolved in Africa, with the population we are closely related to leaving around 60,000 years ago. This migration event led H. sapiens to encounter established Neanderthal populations in the Middle East before becoming established further into Europe and Asia. However movement outside Africa occurred prior to this as early as 300,000 kya in Morocco and 180,000 kya in the Near East. Evidence of this movement within and beyond the African Continent indicates that prehistoric migration occurred frequently in different circumstances and likely related to changes and continuity in surrounding ecology, for example climate and environment. However, migration is not strictly reserved for anatomically modern humans, other hominin species lived and moved across different landscapes; for example, although Neanderthals evolved from a common ancestor outside of Africa, they were a predominantly European species. As part of the ‘migration’ theme the Student Engager team recently put on an put on an evening event where we discussed how our research is linked to human movement. As a researcher who focuses on aspects of human evolution, migration and people moving through landscapes is a constant consideration of mine. The behaviour of prehistoric hunter gatherers was intrinsically linked to their environment, as they relied on resource availability and survival in changing climates. During the Pleistocene, climate fluctuated significantly, and people migrated to survive. Due to a dependence on unpredictable subsistence resources, geographical features like rivers and coastlines played an important part in how hominins moved – humans can survive without food for 3 weeks but only 3-4 days without water. Food resources were also important influencing hominins to move alongside flora and fauna, for example following megafauna in order to scavenge from their prey’s carcasses (Palmqvist and Arribas 1999). 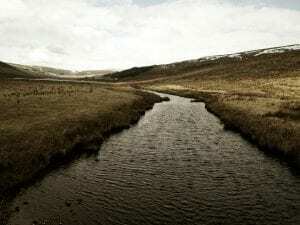 A glacial river valley in North Yorkshire. Riparian corridors and conduits were (and still are) important migratory routes for humans. They cut through difficult terrain and provide predictable resources (authors own image). Britain is an interesting case when looking at examples of human migration as it is located on the very edge of the European continent at a northerly latitude. During the Ice Age, Britain experienced extremes of climate and regularly became inhospitable or impossible to access. The earliest evidence of humans in Britain is found at Happisburgh in Norfolk, where lithic artefacts and fauna have eroded from coastal deposits (Parfitt et al. 2010). The site is dated to > 850,000 years old, with environmental data suggesting a relatively cold climate at the time of occupation. The Happisburgh site is particularly significant as it has pushed back the estimate of human presence in Northern Europe. It is also the location of the oldest hominin footprints located outside of Africa. In neighbouring Suffolk lies another site, Pakefield, which is dated to 700,000 years old, with fauna and environmental data suggesting a Mediterranean climate. No hominin remains have been recovered from these sites; however, the dates, human-made tools, and the size of the hominin footprints may indicate a Homo antecessor or a similar hominin (Ashton et al. 2014). A few hundred thousand years later, we see a new player enter the scene. Homo heidlbergensis arrives at Boxgrove, Sussex. Here, hominin remains have been recovered: a tibia (shin bone) and two teeth (Roberts et al. 1994; Stringer et al. 1998). The archaeological assemblage at Boxgrove is particularly striking because the debris left behind by humans was covered rapidly by slow-flowing water and silt. This process preserved hominin activity at a high resolution, even preserving the outline of a flint knapper’s knees (got to love that “Pompeii” effect). The site is dated to around 500,000 years ago (Roberts et al. 1994). After the relatively warm climate of H. heidlbergensis, Britain experienced a very cold glacial, known as the Anglian. As far as we know no humans were able to survive in this hostile environment. However, this glaciation was particularly important in Britain’s prehistory. Extensive ice sheets influenced the courses of several major European rivers, funnelling them into a large lake in an area now submerged by the North Sea. As the glaciation came to an end, the water level in the lake was supplemented by glacial melt water and this increased pressure caused the breach of the Weald-Artois anticline, a raised ridge of chalk stretching between England and France. For the first time Britain became an Island! Newhaven Chalk with the Seven Sister’s Seaford Chalk formation in the distance. 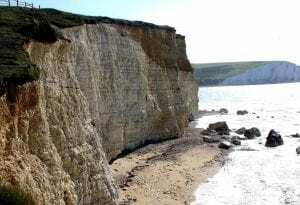 The Chalk of the South Coast once connected Britain to France by a land bridge that was destroyed by glacial meltwater around 450,000 years ago. Although now an island during periods of high sea level, for much of the Pleistocene cooler climates meant Britain was linked to Europe by an area called Doggerland. Doggerland formed a terrestrial land bridge between East Anglia and the Dutch coastline and was an important routeway from the central European continent to its western fringes. People were also able to cross the Channel River, which was created by the flooding at the end of the Anglian. Around 400,000 years ago these terrestrial areas were crossed by another species of hominin, H. neanderthalensis. The first early Neanderthal fossil found in Britain was excavated at Swanscombe, Kent. It is composed of three fragments of crania, which were found separately in 1935, 1936 (Marston 1967) and 1955 (Wymer 1955). There are lots of other sites with stone tools made by Neanderthals, such as Baker’s Hole and Lynford Quarry (Ashton et al. 2016). This indicates a stable and consistent presence of these newcomers; the Neanderthals were here to stay! Post 400,000 years Britain was visited on and off by hominins that had access via land bridges when the climate permitted. Never viewed as a destination, Britain simply represented an extent of territory that was intermittently hospitable; for example, between 160 – 80, 000 years ago the hostile environment recurred and there is no evidence for humans. Incidentally archaeologists have discovered a lot of giant bear remains from this time. It seems bears adapted well to a human-less Britain, expanding their ecological niche (bears and humans have very similar tastes) and becoming massive! H. sapiens (aka anatomically modern humans) didn’t make it to Britain until 40, 000 years ago (Higham et al. 2011) – about 800,000 years after the island saw its first human visitors. There is evidence of H. sapiens at several sites, including Kent’s Cavern and the later dated Gough’s Cave. These humans were highly mobile, adaptable, and carried a distinctive material culture (fun fact: some of them were also cannibals!). But it isn’t until 10,000 years ago that a population of humans reach Britain and persist to survive in such a consistent way that they contribute to modern DNA. 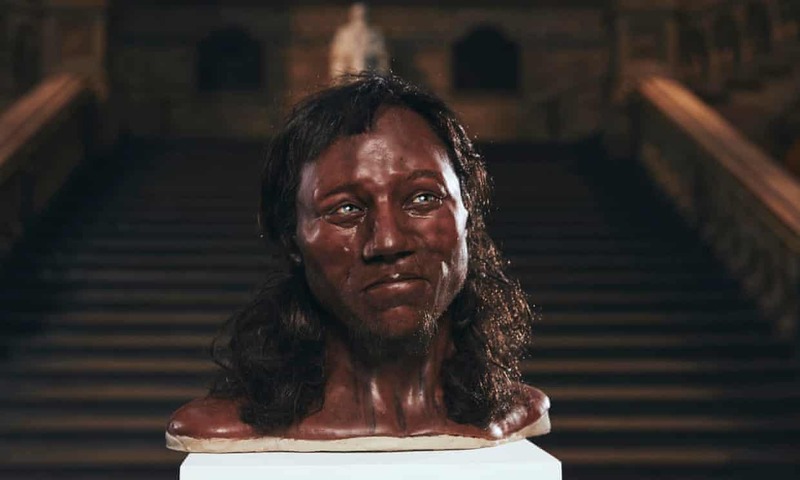 Cheddar Man, found in a cave at Cheddar Gorge, Somerset, is a very well-preserved skeleton of a person that lived in the area 10,000 years ago. Due to the high-quality nature of preservation, the skeleton of Cheddar Man retained DNA that could be used to reconstruct his genome (Brace et al. 2018). This work, published by the Natural History Museum, revealed the population he came from had a Middle Eastern origin. The phenotypic data indicates that he had dark skin and hair, and blue eyes. Comparison with the genomes of humans living today with British ancestry suggests Cheddar Man’s population contributed their DNA to ours and we retain around 10%. However, a new population came to Britain in the form of the Beaker People who arrived around 4,500 years ago. The Beaker people are particularly easy to trace because they buried their dead with a specific type of pot or beaker. A large project studied the DNA of approximately 200 Beaker skeletons, concluding that these people originated in central Europe (Olalde et al. 2018). This data is supported archaeologically by the spread of the distinctive beaker burials. The DNA analysis also revealed that Beaker People had a range of skin and eye colours that wouldn’t be uncommon in Britain today. They thrived in western Europe, almost completely replacing the h. sapiens living there previously, and many modern British people are directly related to them. So, if we total it up, that’s four different types of hominin – antecessor, heidlbergensis, neanderthalensis, sapiens – across around 850,000 years, travelling over land bridges, chalk ridges, and rivers. Following warming climates and resources or retreating from cooling climates. Human presence and absence controlled by geography, geology, sea level, and a climate that was ultimately influenced by the turning of the earth’s axis. The people most related to modern Britons arrived as migrants from Central Europe 4,500 years ago, a drop in the ocean if you consider the first hominin made stone tool dates to approximately 3 million years ago (Semaw et al. 1997). Our British society today encompasses people from all over the world demonstrating an important diversity that is reflected in its complicated human past. For most of its long (pre)history Britain was not an Island and the only hostile environments were driven by climate, not politics..
Arribas, Alfonso & Palmqvist, Paul. (1999). On the Ecological Connection Between Sabre-tooths and Hominids: Faunal Dispersal Events in the Lower Pleistocene and a Review of the Evidence for the First Human Arrival in Europe. Journal of Archaeological Science – J ARCHAEOL SCI. 26. 571-585. 10.1006/jasc.1998.0346. Ashton, N., Lewis, S.G., De Groote, I., Duffy, S.M., Bates, M., Bates, R., Hoare, P., Lewis, M., Parfitt, S.A., Peglar, S. and Williams, C., 2014. Hominin footprints from early Pleistocene deposits at Happisburgh, UK. PLoS One, 9(2), p.e88329. Brace, S., Diekmann, Y., Booth, T.J., Faltyskova, Z., Rohland, N., Mallick, S., Ferry, M., Michel, M., Oppenheimer, J., Broomandkhoshbacht, N. and Stewardson, K., 2018. Population replacement in early Neolithic Britain. BioRxiv, p.267443. Hershkovitz, I., Weber, G.W., Quam, R., Duval, M., Grün, R., Kinsley, L., Ayalon, A., Bar-Matthews, M., Valladas, H., Mercier, N. and Arsuaga, J.L., 2018. The earliest modern humans outside Africa. Science, 359(6374), pp.456-459. Higham, T., Compton, T., Stringer, C., Jacobi, R., Shapiro, B., Trinkaus, E., Chandler, B., Gröning, F., Collins, C., Hillson, S. and O’higgins, P., 2011. The earliest evidence for anatomically modern humans in northwestern Europe. Nature, 479(7374), p.521. Hublin, J.J., Ben-Ncer, A., Bailey, S.E., Freidline, S.E., Neubauer, S., Skinner, M.M., Bergmann, I., Le Cabec, A., Benazzi, S., Harvati, K. and Gunz, P., 2018. New fossils from Jebel Irhoud, Morocco and the pan-African origin of Homo sapiens (vol 546, pg 289, 2017). Nature, 558(7711), pp.E6-E6. Marston, A.T., 1937. The Swanscombe skull. The Journal of the Royal Anthropological Institute of Great Britain and Ireland, 67, pp.339-406. Olalde, I., Brace, S., Allentoft, M.E., Armit, I., Kristiansen, K., Booth, T., Rohland, N., Mallick, S., Szécsényi-Nagy, A., Mittnik, A. and Altena, E., 2018. The Beaker phenomenon and the genomic transformation of northwest Europe. Nature, 555(7695), p.190. Parfitt, S.A., Ashton, N.M., Lewis, S.G., Abel, R.L., Coope, G.R., Field, M.H., Gale, R., Hoare, P.G., Larkin, N.R., Lewis, M.D. and Karloukovski, V., 2010. Early Pleistocene human occupation at the edge of the boreal zone in northwest Europe. Nature, 466(7303), p.229. Roberts, M.B., Stringer, C.B. and Parfitt, S.A., 1994. A hominid tibia from Middle Pleistocene sediments at Boxgrove, UK. Nature, 369(6478), p.311. Semaw, Sileshi & Renne, Paul & W. K. Harris, J & S Feibel, C & Bernor, Raymond & Fesseha, N & Mowbray, K. (1997). 2.5-Million-Year-Old Stone Tools from Gona, Ethiopia. Nature. 385. 333-6. 10.1038/385333a0. Stringer, C.B., Trinkaus, E., Roberts, M.B., Parfitt, S.A. and Macphail, R.I., 1998. The middle Pleistocene human tibia from Boxgrove. Journal of human evolution, 34(5), pp.509-547. Wymer, J., 1955. A further fragment of the Swanscombe skull. Nature, 176(4479), p.426.